I love meals that last for days, and this is definitely one of them. If you’ve never made one, they are super simple. Basically, you just sauteé whatever veggies you like and throw a bunch of eggs on top. I like to make a big one for the week and heat up a slice in the morning. You may or may not enjoy this cold, so it’s best to make it when you have a microwave at work. The first recipe I made from the cookbook was the Goat Cheese Fritatta, which was great, but I had to double the salt, pepper, and garlic to suit my tastebuds. This makes me think that the seasonings in these Mediterranean recipes might be toned down to please bland American palates. Salads are great to take to work, but they wilt and taste like crap when they are hot, so if you are going to be outside take an ice pack with you. In the last post I mentioned Wendy’s salad in a jar, which is a great way to prepare salads ahead of time and keep them fresh. Don’t forget to include nuts and beans for added protein. And fruit salads! There is a recipe for Pomegranate Salad in the book that looks great. If you want to turn your salad into a more substantial meal, add salmon or tuna (or tofu for vegetarians). If you want to please your stomach with more carbs, add pasta. Couscous and polenta keep well in the fridge for days. I included a great couscous recipe in my last post, Eat Healthy On Tour. Polenta will congeal when not kept warm, so you can just cut off a slice and pop it in the toaster. 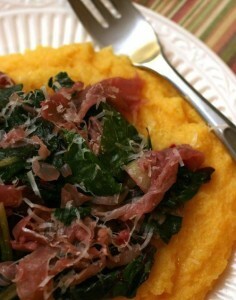 Peterson includes a recipe for Polenta with Prosciutto and Parmesan, but I like to use mushrooms and onion instead of prosciutto. The cookbook includes several recipes with beans that would both taste good cold and be fine to carry around, including Black Beans with Tomatoes and Feta. The secret ingredient for most of these recipes is feta cheese. Yum. Wendy suggests eating protein-rich food together with a bit of fat to slow digestion at meals. As you can see, all of the above recipes can be modified to have more or less protein and fat. The other recipe from this cookbook that I tried out myself was Grilled Scallops. Scallops are great! They are a little expensive and might be hard to find fresh in your town, but they are super easy to prepare on a grill or in a pan and make for a very impressive meal. Research has shown that people who live in these areas have less heart disease and better longevity. This book is more than a cookbook; it also includes a nice survey on the Mediterranean lifestyle and its health benefits. This is important because heart disease is the number one cause of death in the US. There is a great story in Malcolm Gladwell’s book Outliers about Roseto, a US town that in the 1950s was heavily populated by Italian immigrants and had an incredibly low rate of heart disease compared with the rest of the country. After researchers exhausted all other hypotheses about diet, exercise, and location, they discovered that it was the community itself that made people more healthy. You can read the entire story here. Along with nutrition, Peterson’s cookbook covers some of these intangible qualities of work-life balance in her attempt to describe the Mediterranean lifestyle. 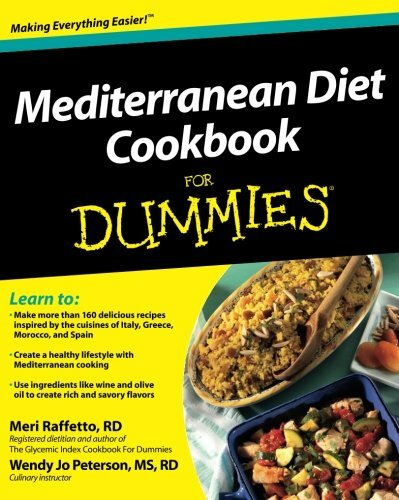 Mediterranean Diet Cookbook also has good information on incorporating more plant-based foods into your diet. This is important to me because I eat mostly vegetarian, but also because I recently watched the documentary Knives Over Forks. If you haven’t seen it, it basically blames meat and dairy for cancer. Polarizing much? When I started reading this book, I thought: “I’m going to find some fast easy recipes for busy sound engineers.” In the end I found a lot more value in the recommendations for relaxation and stress reduction. There is much more to the Mediterranean lifestyle than just olives and wine. It’s gathering for food with our friends, family, and community that really reenforces our human connections and emotional balance. Do you have a Mediterranean style life-hack? For more about how to recover from a long work day, the best snacks for instant energy, and nutrient-rich meals for the road, listen to my entire interview with Wendy Jo Peterson.